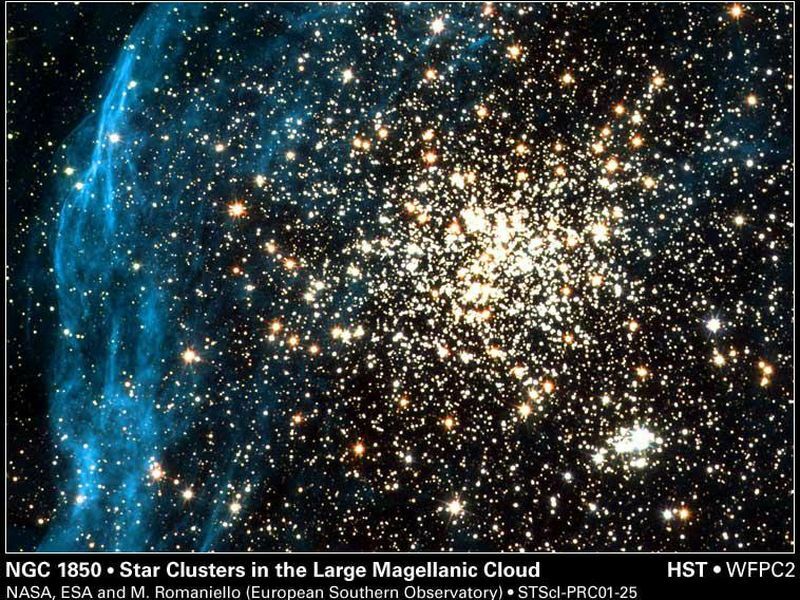 By spying on a neighboring galaxy, NASA's Hubble Space Telescope has captured an image of a young, globular-like star cluster -- a type of object unknown in our Milky Way Galaxy. The image, taken by Hubble's Wide Field and Planetary Camera 2, is online at http://hubblesite.org/newscenter/archive/releases/2001/25/image/a/. The camera was designed and built by NASA's Jet Propulsion Laboratory, Pasadena, Calif. 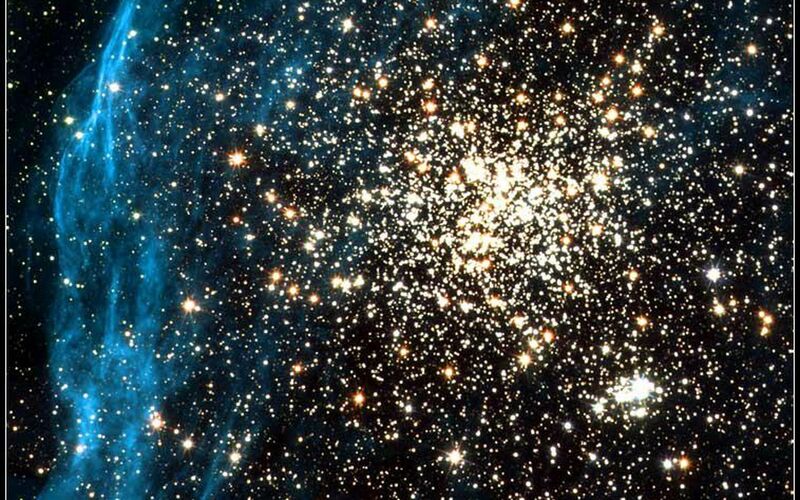 The double cluster NGC 1850 lies in a neighboring satellite galaxy, the Large Magellanic Cloud. It has two relatively young components. 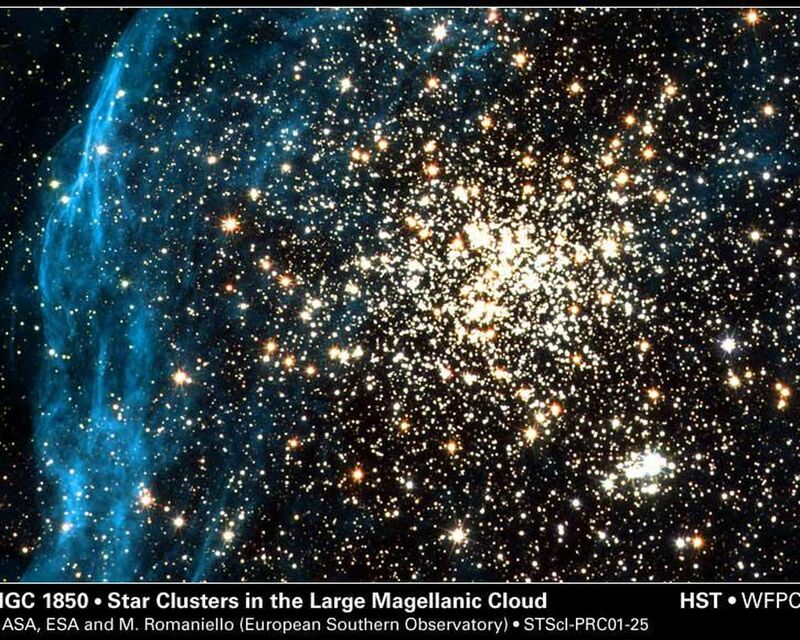 The main, globular-like cluster is in the center. 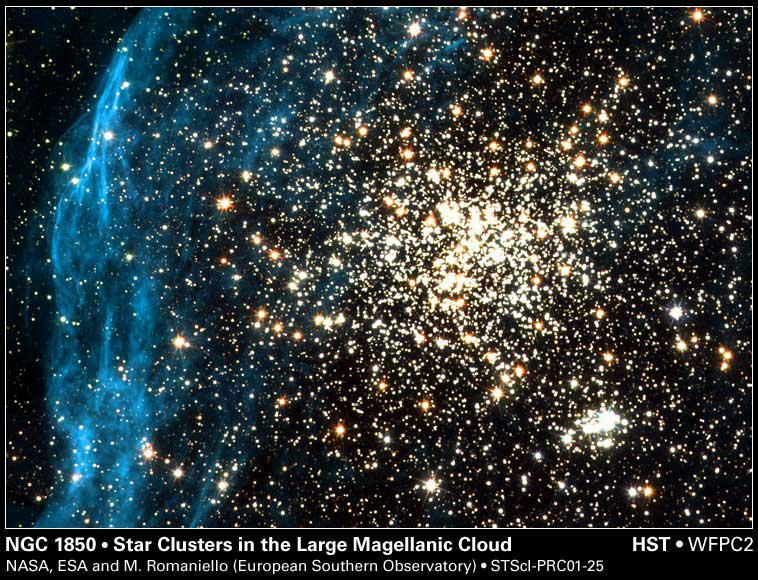 A smaller cluster is seen below and to the right, composed of extremely hot, blue stars and fainter red T-Tauri stars. The main cluster is about 50 million years old; the smaller one is 4 million years old. A filigree pattern of diffuse gas surrounds NGC 1850. Scientists believe the pattern formed millions of years ago when massive stars in the main cluster exploded as supernovas. Hubble can observe a range of star types in NGC 1850, including the faint, low-mass T-Tauri stars, which are difficult to distinguish with ground-based telescopes. Hubble's fine angular resolution can pick out these stars, even in other galaxies. Massive stars of the OB type emit large amounts of energetic ultraviolet radiation, which is absorbed by the Earth's atmosphere. From Hubble's position above the atmosphere, it can detect this ultraviolet light. NGC 1850, the brightest star cluster in the Large Magellanic Cloud, is in the southern constellation of Dorado, called the Goldfish or the Swordfish. This image was created from five archival exposures taken by the Wide Field Planetary Camera 2 between April 3, 1994 and February 6, 1996. Additional information about the Hubble Space Telescope is available athttp://www.stsci.edu/hst/. More information about the Wide Field and Planetary Camera 2 is available at http://www.stsci.edu/hst/wfpc2.